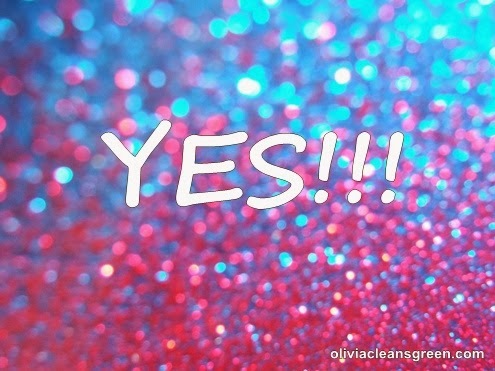 Olivia Cleans Green: What Will You Say "Yes!" To? I'm saying yes to daily afternoon dance breaks. I'm saying yes to naps when I need them. I'm saying yes to second and third servings when I want them. I'm saying yes to cuddling my critters, especially when I'm "too busy". I'm saying yes to working a lot in pursuit of my dreams without working "hard." I'm saying yes to loving the struggle of difficult times. What will you say yes to in order to be healthier and happier in 2014? OMG, YESSSS Olivia! I LOVE this! I need to work on my Yes list! I think I will do that instead of a to-do list from now on. Yes, girl, I say yes! Yes to dates with friends, yes to honoring my body, yes to painting my nails more often! Thanks Olivia...great post! thanks Shon! that all sounds awesome. i just bought a glittery bottle of nail polish. i'll be joining you on that one.